Looking for a portable vaporizer that’s sleek, stylish and efficient? The Magic Flight Launch Box may just be the perfect choice for you. 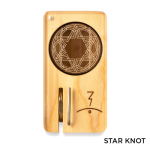 Simple and easy to use, the MFLB gently heats herbs, ensuring that they never combust. If you’ve used portable vaporizers in the past, you know just how easily they can burn herbs. But the MFLB vaporizer takes a different approach to their design, allowing your herbs to vaporize – but never combust. But gentle heat isn’t the only reason users say the Box is the #1 pocket vaporizer. Its stealth and portability are unmatched by other portable vaporizers. Let’s take a closer look at what the Magic Flight Launch Box has to offer and how it works. Want to vape on the go? The MFLB is the perfect choice. Small and portable, you can use this vaporizer in public – providing you know what you’re doing. The Box produces no additional odor and no smoke. Once you develop your stealth technique, you can use the Box just about anywhere. Just keep in mind that some herbs have a strong odor even before they’re vaporized. But with the right technique and the right material, the Box can be virtually smell-free. Smell aside, the MFLB looks nothing like a typical vaporizer. 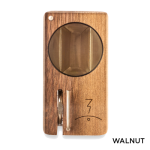 Made from beautiful hardwood (Cherry, Maple or Walnut) with stainless steel, glass accents and detailed designs, this vaporizer looks like a piece of art. It’s small enough to hide, but even if someone does see it, they’ll never know that it’s a vaporizer. Let’s face it – portable vaporizers are more convenient and easy to use than desktop models. Unless you only plan on using your vaporizer in your home, you want a model that’s easy to take with you on the go. The Magic Flight Launch Box offers the utmost in portability. 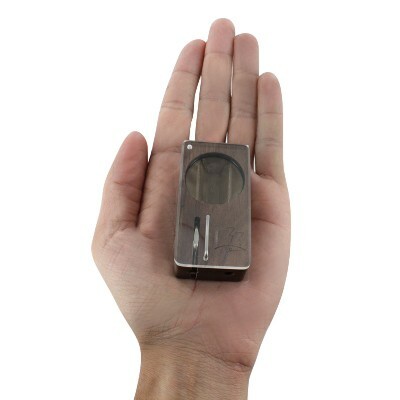 At just 2.5 x 1.25 x 0.9 inches, this vaporizer is small enough to fit in your back pocket or purse. Powered by battery, you’ll never have to fuss with any cords or stay confined to one room just to use your vaporizer. Just pop in the battery, draw and enjoy. Worried about your herbs combusting? Don’t be! The battery powers the heating element, which gently warms your herbs. It produces just enough heat to release the herb’s active ingredients – without burning them. It’s true that the MFLB doesn’t have an external temperature control, but that’s because it doesn’t need one. Calibrated to 380 degrees Fahrenheit, the Box heats up to its optimal temperature just four seconds after it’s started up. What if you want to heat up or cool down your herbs? You can control the device’s temperature with your draw rate. Faster draws mean cooler heat. Slow draws mean higher temperatures. And because you’ll be drawing directly from the box, you’ll be able to sense the temperature of the vapor, so you can adjust your draws as necessary. Pocket vaporizers are convenient, but so many models waste heat and herbs. 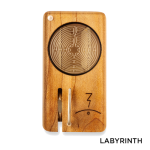 The MFLB is the most efficient in its class because it only generates vapor when needed. 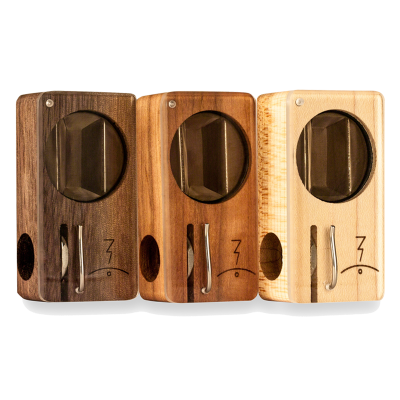 After each draw, you remove the battery, so the vaporizer doesn’t stay hot in between draws. The Box also uses its IR characteristics carefully. IR vaporizers are far and few between because the technology to create them is more costly than other heating methods. But here’s where IR truly shines: its design is similar to pure convection. And with the Box, you only use as much heat as needed to vaporize your herbs. What does this all mean? With the Magic Flight Launch Box, you get nothing but pure vapor. 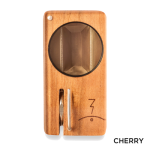 You use exactly as much heat as you need to vaporizer your herbs, and the Box doesn’t continue to heat your herbs in between draws. You get the most out of your herbs, and enjoy a pure flavor every time. Grind your herbs to a fine consistency. Slide the MFLB lid to one side. Sprinkle your material into the bowl. Place a freshly charged battery into the box. After each draw, take out the battery and shake up the box, so it’s fresh and ready for the next draw. upports approximately one load, or about 4-8 draws. Looking to enhance your vaping experience? A power adapter that eliminates the need for batteries. Plug into an outlet at home, or into your car with the included car adapter. 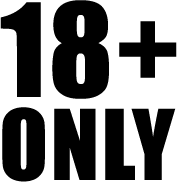 Orbiter: A glass attachment that cools your vapor to absolute perfection. The perfect accessory to have on hand when you’re sharing with friends. Comes with two water pipe whips and an instruction guide. Dart Stem: A classic accessory that serves as a flat mouthpiece for comfortable draws every time. Made from pure maple, the mouthpiece is naturally resistant to fungi and bacteria. Finishing Grinder: This special grinder produces a super-fine grind. It’s designed to sit right on top of the bowl of the Box, so you can deposit the material right into the trench with ease. 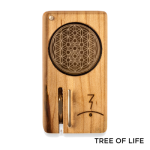 With so many great accessories available, the MFLB is a great option for anyone who wants to vaporize on the go. How does the Magic Flight Launch Box compare to other vaporizers, like the Iolite? While both are small in size, the Box is pocket-sized and features a discreet design. The Iolite, on the other hand, is more conspicuous and not quite as easy to use. As far as performance goes, MFLB wins out here too. For the utmost in portability and stealth, the Magic Flight Launch Box is the clear choice.